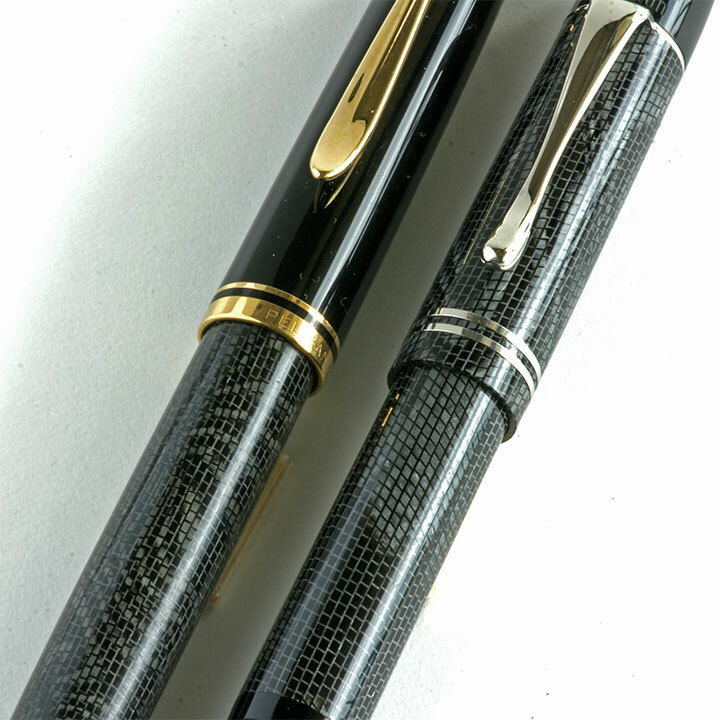 Pelikan’s 101N Lizard from the 1930’s is a highly sought after and well-regarded fountain pen. At auction, it can command prices upwards of $1500-$2000. It’s finish is unique and stands out against Pelikan’s more well-known tortoise designs. The release of the M101N Lizard in 2012 served as a modern homage to that originator but the finish seemed to fall short of expectations and, anecdotally, does not appear to have been as well received as the M101N releases before and after it. Regardless of your opinion of the pen’s appearance, if you thought that the 2012 M101N Lizard was the first time that Pelikan re-visited the lizard design, think again. 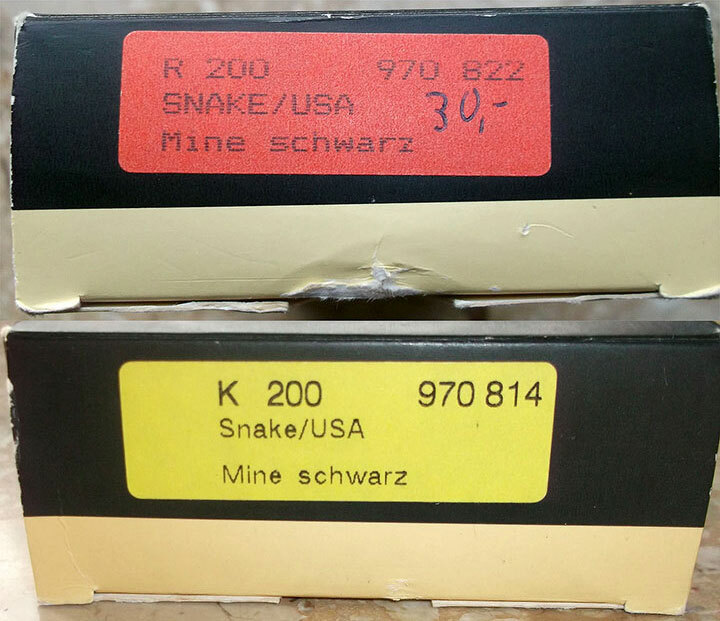 Sometime in the mid-1990’s a special edition set was released to the United States in a pattern then described as “Snakeskin.” If you look at it in person, it is very similar, if not identical, to the lizard pattern of today’s M101N. While the rollerball and ballpoint versions can still be had with minimal difficulty, very few of these snakeskin fountain pens have ever been seen and information on them is sparse and incomplete. Maybe this is because there is some truth behind one rumor that contends that only ten such pens are known to exist. While I can’t provide any validity to that rumor, after much research, I believe that I have cobbled together a plausible origin story and will do my best to try to shed some light on this seldom seen model. Taking the brochure at face value, it would seem clear that there was indeed an M200 Snakeskin fountain pen available for special order. 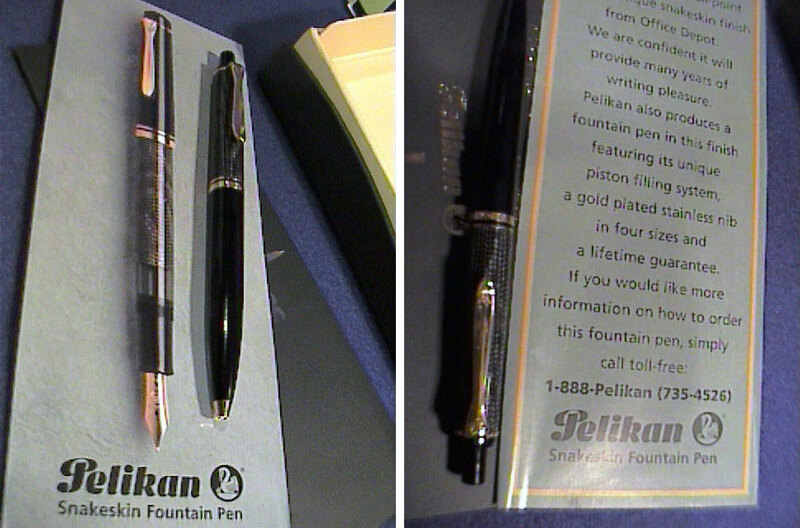 While the provenance of the brochure cannot be verified, I find no reason to question its authenticity other than the sparse number of M200 Snakeskin fountain pens that have ever been noted. The question that follows then is just how many were ordered and how many may remain in existence today? I have only ever seen two examples in the wild. One was sold by Rolf Thiel (a.k.a. missing-pen) and the other is owned by Daeng (a.k.a. daenghafez on FPN), a well-known Pelikan enthusiast and contributor to the larger fountain pen community. Since this pen was released prior to the 1997 trim change, it is identified by its derby cap top, absent trim ring at the piston knob, double cap bands, and stainless steel gold-plated nib. Available nib sizes would have likely been EF, F, M, and B. The furniture is gold-plated and the ink window is grey. Daeng’s example has a 14C-585 nib which I believe was placed after the fact rather than accepting that there was a separate M250 release in this pattern. Interestingly, the brochure mentions a lifetime guarantee which is unusual for Pelikan as their standard warranty is only three years, even on their high-end Souverän line. It is at this point where the available factual information runs out leaving only speculation. Based on the near complete lack of availability on the secondary market, I believe that only very few of these M200 fountain pens were ever made to order. Fountain pen enthusiast who are likely to buy this pen don’t often shop for pens of this nature at a big box specialty store such as Office Depot. It is unclear to me for how long these pens were available, how widely they were distributed, or how well they were advertised. The pamphlet presented above is the only provenance that I have and it is from an unknown internet source. I have previously listed this snakeskin variant as an M250 in my catalog based on the example that I have seen with the 14C-585 nib. In light of the above information and the visual verification of Rolf’s example, I am moving it to the M200 catalog which seems more appropriate given the available evidence. I did make an inquiry to Chartpak, Pelikan’s U.S. distributor, but they did not have any information to provide me on this model. 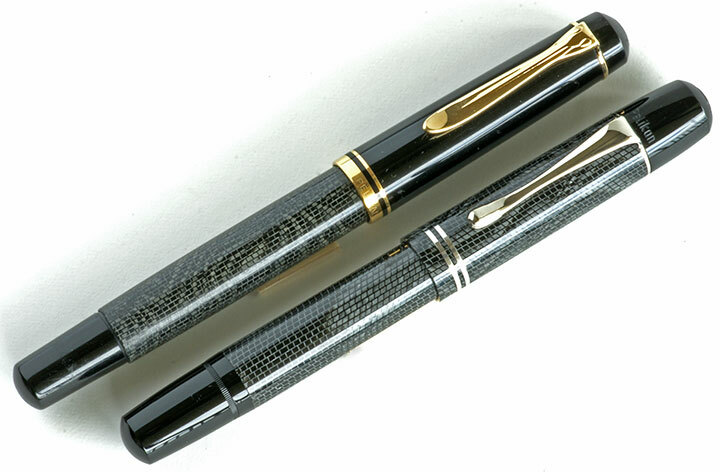 If you have an M200 Snakeskin fountain pen, have any more knowledge of its origins, or just think that you may know the whereabouts of one, I would truly love to hear about it. i have M101N lizard fountain pen, and i still think it looks stunning. The finish really doesn’t get the attention that some of the other models do. That Snakeskin/Lizard pattern just doesn’t seem to gain the same traction. The M101N Lizard appears to be the least popular of the M101N releases, rightfully or wrongfully so. yeah, i think most people prefer something that is more colorful. My cap broke. I have one of these. Does anyone know where i can get the cap to replace it (black or lizard)? If it is an old style black derby cap that broke, you might be able to source one off eBay. You likely could find a parts pen there that would fit your model. You could even find an older rollerball which should be cheaper than a fountain pen which would also have a compatible cap that you could source. Look for old style M200/R200 or M250/R250 caps. Sorry that yours broke and good luck fixing it up.